Ninja Warrior Wrecking Ball Inflatable – 8 pedestal giant inflatable fun for ages 8 and up. 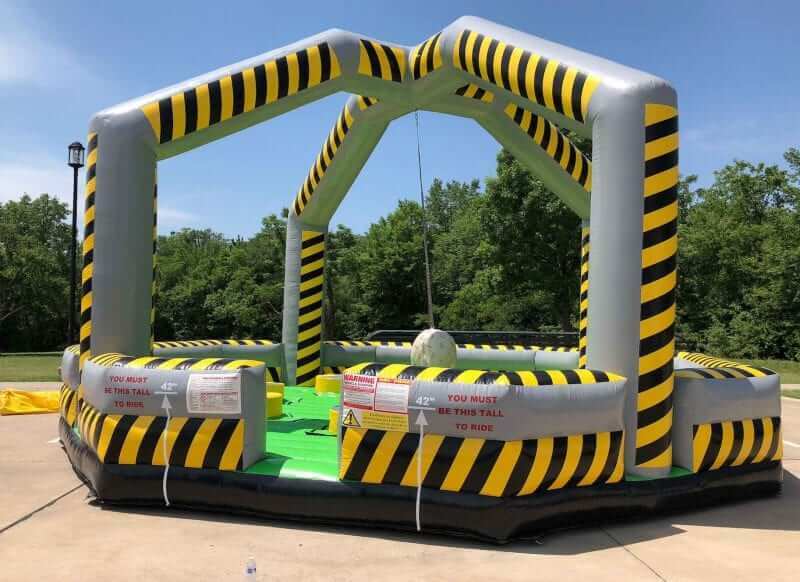 Giant wrecking ball inflatable to test your speed, strength, and agility with our new wrecking ball challenge! Need a new idea or something extra special for your party rental. This fun and popular inflatable features a wrecking ball and 8 pedestals. Stay on the pedestal and not get knocked off to be the winner. This is a perfect item for a team building event with 8 pedestals and plenty of surface area to have tons of fun. Talk about core activity, try to balance on the pedestal with a ball swinging your way. So much fun with your friends and colleagues. This is a great team building activity around. Need an indoor giant inflatable item. The ninja warrior inflatable can be installed indoors. We also can convert the ninja wrecking ball inflatable to the ninja warrior wipeout game.